I have one. It is the first one below. Maybe it is of dubious taste. I don´t know. It is only a very short exchange but I think it does convey a lot. 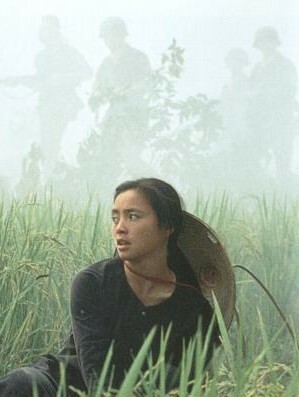 It is taken from what I think is one of the most emotional Vietnam movies. I´m sure many of you know it. Got it? No, no, don´t worry. It is not over yet. I´m only just starting. Here are another few for you to puzzle over. Solutions follow as well. I hope this quiz was not too easy for you. Here are the movies (yes, one is not strictly speaking a movie) in the wrong order followed by the solution underneath. Heaven and Earth, Born on the 4th of July, Dear America, Flight of the Intruder, We were Soldiers, Good morning, Vietnam, The Deer Hunter. This entry was posted in Quiz, Test yourself, Vietnam, War Movie and tagged Movies, Quiz, Vietnam War, Vietnam War Movie Quotes, War Movies.